I am joining in late with CASE Study Challenge. In case you don’t know yet, we have a new muse; a very well known person in the world of paper crafting, it’s the artist Jennifer Mcguire! We also have a new month long guest designer. Welcome aboard, Kimberly Wiener! 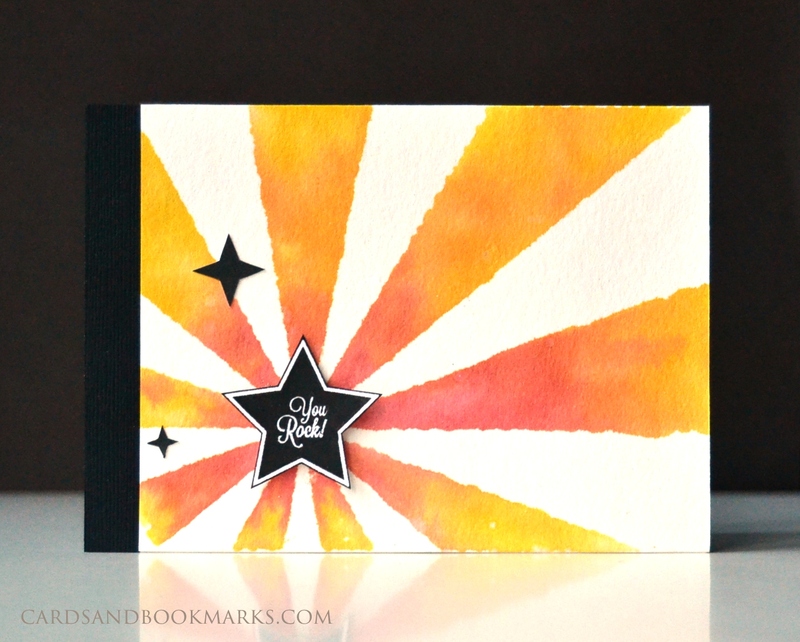 A classic Jennifer Mcguire card; bright, happy and colorful. I was inspired by the rays and decided it was time to put my Hero Arts/Studio Calico Starburst Background into use. I splashed Distress stains on the stamp, sprayed it heavily with water, then pressed a watercolor paper on it face down. I used a 1/2″ wide black strip as a seam for the card which opens sideways. The stars are from the Hero Arts/Studio Calico Darling Sentiments set. Make sure to visit the CASE Study Challenge blog and check out what the rest of the design team came up with, as well as our guest designer and our muse Jennifer Mcguire. Love that spray technique, and the rays are a perfect way to show that off! Ooh, I LOVE how this turned out! Another WOW card Tasnim! This is incredibly cool!